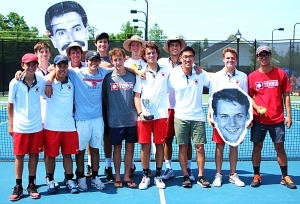 A third match against Region 7-6A foe Johns Creek for the Dunwoody Wildcats was hard fought before the Gladiators grabbed the Class 6A Boys’ State Tennis title 3-0 at the Rome Tennis Center at Berry College on Saturday. Dunwoody (15-8) was making their sixth appearance in the state title match having won four state titles with the last coming in 1989 and the last championship appearance coming in a loss to Westminster in 2006. Johns Creek (18-2) won the first two meetings this season 5-0 and 3-0 (Region 7-6A semifinals) and headed into Saturday’s meeting 2-0 in the state playoffs against the Wildcats (2011, 2012). The Wildcats battled valiantly extending games with long points, but having trouble getting the needed wins to prolong the matches. Matthew Moussouri and Quinn Wicklund won their opening set at No. 1 doubles to get the Wildcats’ fans excited early on in the match. Johns Creek’s Cole Gromley, a Georgia Tech signee, started the 3-0 run for the Gladiators with a 6-1, 6-0 victory over Dunwoody’s Cole Brainerd (9-3) to make it 1-0. The second Johns Creek point came as Jackson Hanroth and Zach Fisher knocked off Dunwoody’s Daniel Bynum and Kyle Puni in straight sets. Moussouri and Wicklund (13-4) having a 6-4 win in the opening set had Johns Creek’s Jack and Britt Lee battle back to win the second set 6-3 and force the beginning of the third set. 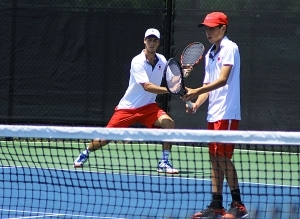 Dunwoody’s Adam Drucker rallied from a 2-6 loss at No. 3 singles and was battling Alex Hymel down 3-4 in the second set when Ethan Howie clinched a two-set victory with a 6-4 victory in the second set against Dunwoody’s Cade Lautenbacher (10-5). The loss ended Dunwoody’s five-match win streak dating back to the consolation finals of the Region 7-6A tournament against Centennial. Dunwoody defeated No. 2 seed Winder Barrow 3-0 in the opening round of the state playoffs and followed with wins against No. 1 seed Harrison (3-0), No. 1 seed Glynn Academy (3-0) and No. 2 seed and Region 7-6A foe Northview (3-1) to reach the title match.